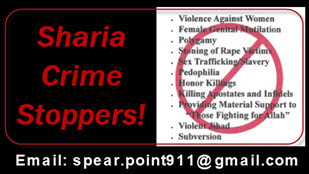 Sharia Crime Stoppers offers certified training for Local Law Enforcement personnel for County Sheriffs to officers in the field, along with detectives and intelligence officers. There is no cost for this training other than the travel expenses of the instructors. Contact Spear.Point911@gmail.com for course outlines and other details. Contact Spear.Point911@gmail.com with questions or comments regarding any of these topics. Candidates Running for Office in 2017/2018: Who Is Brave Enough to Take a Stand – Against the Red-Green Axis on Massive Immigration?